Sneaking in another Christmas card. Loved the idea of using some non traditional colors. Paper, say hello to just ink and stamps. Sentiment from Concord & 9th's O Christmas Tree, and the branch and sparkle from Essentials by Ellen's Brushstroke Christmas. MOOD WHEN DONE = I'm good!! what a fun card, Joan - wonderful color choice and design! Love the design and colors, Joan. Love the little starburst accents, too. Love the colors! 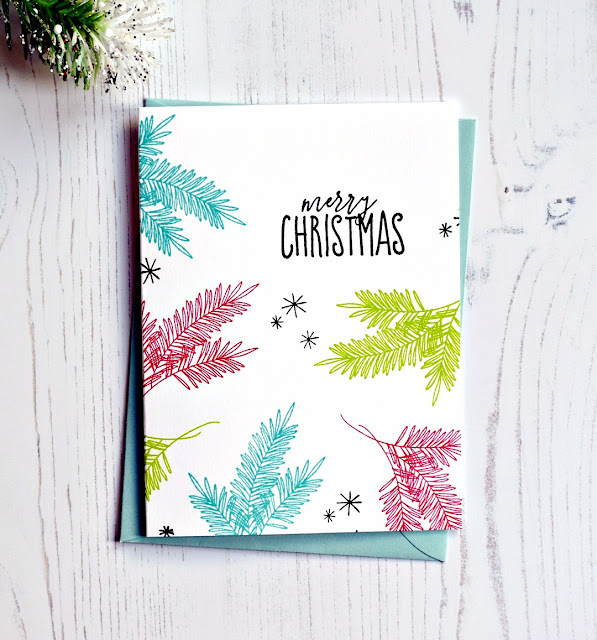 Beautiful card that is a perfect example of how layers and embellishments aren't necessary if you have a great design. I love it! And just look at that perfectly matched envelope. I love it even more!